Author’s Note: This is part seven of a series on the redevelopment of the old Southeastern University site in Southwest. These articles will serve to provide information for the greater community, and not to take a side on the development debate. This series, started in September of 2015, continues to focus on the site at 501 I St., SW, where Shakespeare Theatre Company (STC) and Erkiletian Development Group have proposed the development of a mixed-used building to be named “The Bard” after William Shakespeare. Past articles can be found on “The Southwester’s” website for those who are interested in where this story has been over the last four years. The January Zoning Commission hearing was postponed until March 28. As a result of this change, ANC 6D has also postponed consideration of the revised proposal until their March 11meeting. UNSW is a group of neighbors, particularly those in the immediate townhomes around the project, who have actively voiced their concerns over the height and density of the project, particularly related to what has been called for in the city’s Southwest Small Area Plan. On December 17, 2018, the Zoning Commission voted unanimously to give “advance party status” to UNSW, giving the group official status before the Zoning Commission. 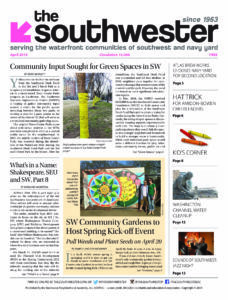 “The Southwester” will continue to cover the story, and, barring any additional scheduling changes, will have an update in our April issue.